EDIT: there is now an official podcast of the complete audio here. ..and earlier today Felicia Day and Wil Wheaton talked about The Guild Season 4 at a panel. Ace Guildie @Keithallgamer managed to record most of it so I've embedded it as a video here. Why a video? Because you can't upload audio to Blogger. It's nearly an hour long but I've saved it as a .3gp so it shouldn't be too resource-hungry. if you have problems with it please let me know and I'll pop it onto higletfilms.com. You can find out more about Phoenix Comicon on the website - they have some great guests like Stan Lee and James Masters. Webventures Finale - all that and more! 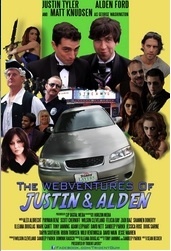 The Webventures of Justin & Alden - finale now up! So then, what did we learn? If you haven't seen the finale of Webventures then get watching now! I don't want to give the ending away. It would take too much time since the conclusion is immensely fast-moving and, like sponsors Trident gum, layered. I suggest you watch it at least twice because you're bound to miss things otherwise. Of course Felicia Day is magnificent and she gets the prize (or she will eventually, one would think), but she isn't (dare I say it?) the star of show. Justin and Alden, or rather their (groan) "Manlationship", are/is the star. And don't forget to watch right up to the end because the last shot is priceless. As cheesy and contrived as the whole conceit is, it completely works for me. I said before that it was pitched perfect(ly) and the conclusion never wallows or grates. It just...works. And, more than that, it has helped me come to terms with the Streamys 2010. It has exorcised some of the bad mojo because Justin and Alden embody the spirit of what I wanted the Streamys to be about: having a dream, making it happen and hot vampires. Er, no...Friendship, journeys well travelled and bromance. Er...getting all your acquaintances together and putting on a show? Well, something like that, anyway. Question time - Who IS Wilson Cleveland? Wilson is a veteran of webseries creation and is the person behind the people behind "Webventures". Or something like that. What does that mean? I have no idea. And so I will be interviewing Mr Cleveland later today about his roles, what it was like to work with folk such as Sandeep Parikh, Tony Janning, Sean Becker and Taryn Southern, and what the future of branded webseries might be. Sometimes, dear readers, you have to earn your keep. I can't be expected to think of everything, all the time! Mr Cleveland is expecting some intelligent questions and I have a deadline. So, rack your brains and send me your questions so it looks like I know what I'm talking about. Come on - I've not asked you to vote for anything in ages, so really you - owe me! Please? The Guild Season 3 DVD - in stores now! Celebrating Towel Day/Geek Pride Day with some Guildie Pride! 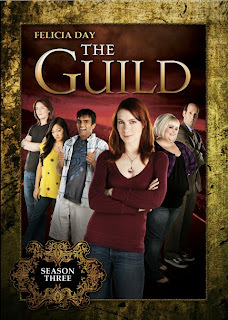 The Guild Season 3 DVD is now in the shops! Can we get a w00t? All the details are on WatchTheGuild.com, including information for international fans. There are so many extras on the DVD. Even if you've watched them on the internet a million times you'll want to get the DVD because there will be lots you haven't seen. 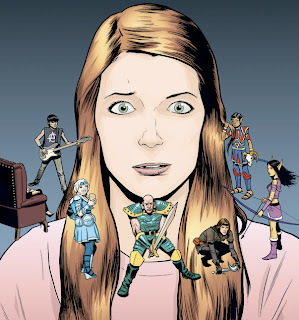 The Guild Comic #3 is in shops tomorrow! I can't wait to find out what happens next. I'm having them delivered and #2 turned up last week and was instantly devoured by me (and hubby and oldest daughter..). 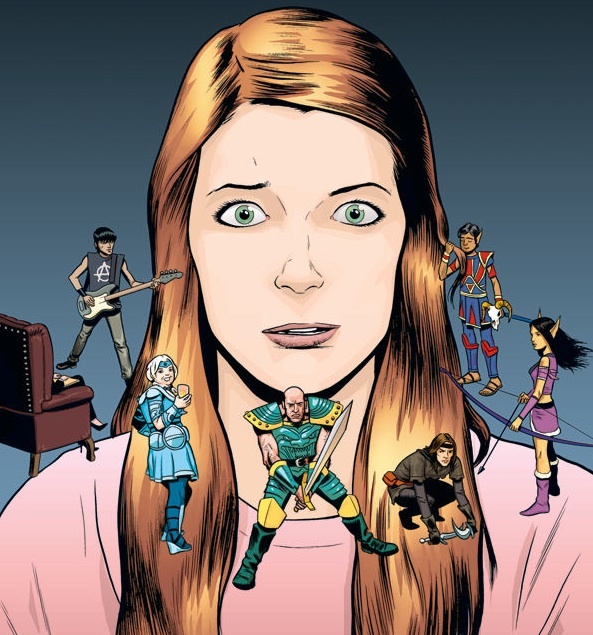 You can get a sneak preview on ComicBookResources.com - it looks like another action-packed, emotion-wringing edition! And as you can see from the pictures on the WatchTheGuild Flickr stream (above) everyone has been working hard. The end is in sight and @theguild has confirmed via Twitter that Season 4 will be out in July! You could still get lucky and receive an exclusive MP3 remix of "Broken Lullaby", the Goodnight Princess theme. See here for details - it's easy to enter! Higlet Films - because everyone loves a snappy title! HigletFilms.com - look familiar at all? After a busy weekend of getting the last few things in place and recording the first episode of our next webseries, we managed to also launch the HigletFilms.com website. We will be adding a lot of content to over there in the next few weeks, so lots to look forward to. To celebrate HigletFilms, and the release of the Goodnight Princess Omnibus today, we are holding a competition and the prize is an exclusive MP3 remix of "Broken Lullaby". All the details on how to enter are on HigletFilms.com - but hurry! This is a limited offer! 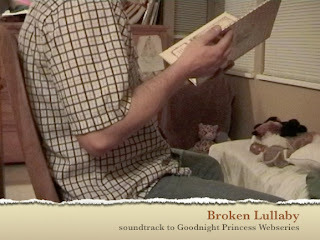 "Broken Lullaby" cover - coming soon to CDBaby.com! The first official picture from The Guild S4 set from @theguild - how exciting! For the last week I've been waiting for today with mixed feelings. On the one hand I'm really looking forward to seeing the results of this weekend, and on the other I'm sick as a parrot that I won't be there. Because this weekend The Guild are filming all the Extras scenes for Season 4 - yay! The power of The Guild knows no bounds! If you want to get the information first then you need to be following @theguild on Twitter. I'm sorry I won't be there but I can't wait to see the results of all the hard work. New Media mavern, @JenniPowell, caused a stir this morning with an unauthorised picture DIRECTLY FROM THE SET! If you want all the latest information about The Guild then you need to be listening to KOTG podcast and following @knightsofguild. Hosts Kenny (@geekyfanboy) and Jenni (@jennipowell) are on set today and will be posting about it soon. Already this week they posted an hilarious interview with Greg Aronowtiz, Paul & Storm and Kim Evey all about the stunning April Fool's prank they pulled, "KOTG Microcast #18 Quest for Lil’ Guildies". And released today we have "Knights of the Guild Ep 16 pt1" which features the usual round up of Guild happenings, a fan interview and much more (plus some rather stimulating pictures of actor J. Teddy Garces, who plays Bruiser). I'm off to listen to that now! If any readers is an extra on The Guild please contact me because I'd love to talk to you about your experiences on set (spoiler-free, of course!). Either leave a comment here or email me: worldofhiglet at gmail dot com. Like many other people I tuned into Twitter last night hoping to pick up a feel of what was going on at the meeting. I'm not a member of the IAWTV but I feel that I'm part of the wider community and I'm very interested in finding out what the future holds. It was hard to fathom what was going on from the few people who were tweeting during the 3 hour meeting and I was relieved when I read that New Mediacracy were going to be recording a podcast straight afterwards. I knew that meant that I would get some answers. ...and I can say that if you feel that you are a stakeholder in the community too, then you need to listen to this podcast. "The One About The IAWTV" has regulars Steve Woolf, Zadi Diaz and Chris McCaleb talking with Tony Valenzuela, Casey McKinnon, Barrett Garese, Brett Register and Rudy Jahchan about the meeting and the implications for the future. They give some information about what happened at the IAWTV meeting and the discussions they have about what they would like to see in the future are interesting, passionate and food for thought. You should also read the post Jeff Koenig wrote before the IAWTV meeting "15 Ideas the IAWTV Should Consider to Help Protect Independent Web Series". It received a well-deserved mention on the podcast and is very well written and thought out. I will be writing about this in more depth in the next couple of days but the issues they raised about gatekeepers, structures and inclusion are things that I have been wrestling with and they affect everyone - creators and consumers alike. New Media is just that - new. It doesn't have to repeat the same mistakes old media made. Listening to the podcast gave me more hope that the future will be better. If you listen to the end I get a shout out which was a very pleasant surprise (except for the dog who jumped up when I yelled). Two for two, which is pretty humbling (Kim Evey and Jenni Powell also gave me a lovely shout out on the previous New Mediacracy epsiode, "Episode 12: Post-Streamys Breakdown and a New Season of The Guild"). I'll try not to let it go to my head. The Webventures of Justin & Alden: now on your intertubes! What would YOU do to get famous? Webventures is multi-layered, not unlike the Trident Gum so artfully placed within each episode. On one level it is a buddy movie with the familiar standards of the less-than-smart slacker and his even-less-smarterer friend who are fighting against 'The Man' to achieve a dubious goal (where 'fighting' equals 'driving around in apparent circles', 'The Man' is their obscurity and the dubious goal is fame. And Felicia Day.). Webventures is also a road trip where the guys live and love and learn. Just, you know, with not much of any of those things actually happening. On another, slightly more elevated level, it is a stark indictment of the paucity of ambition in today's youth, where the only motivation to do anything is driven by a desire to achieve that most ignoble of goals - FAME! They want to live forever. They want to learn how to fly. Fame! Remember....What were we talking about again? Oh yes. Pie. And the last layer is the same as the first. Like pie. It's a snappily-written comedy that manages to knit together most of the stars of the webseries firmament into a mostly-believable* narrative where product-placement literally provides cohesion. Where we go back to the future to when soap operas were a legitimate form of entertainment (and advertising), and George Washington roamed the earth. It might be easier to list the people in new media who aren't involved in some way with this series. From the writers Sandeep Parikh (Legend of Neil and The Guild) and Tony Janning (Legend of Neil) to the actors Justin Tyler and Alden Ford (both from Milk Men) and award-winning director Sean Becker (here's my interview with Sean), this webseries has a serious pedigree. And it shows. Don't forget that Goodnight Princess Act 1 and Act 2 are now up on YouTube. The final Act 3 will be out next Monday and you can find out more here. We've had some really positive feedback so far - so yay for trying something new! ** I'm trying not to hold Sean Becker responsible for Kenny's recent troubles, but I think we all know who the culprit was. *** You can blame Hubby for these. Sandeep and Tony have now legitimised his obsession with puns and now he Just. Won't. Stop. Act 2 is now up! 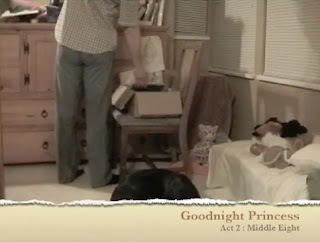 We continue this experiment in short form drama, or Internet Play, with the second installment of Goodnight Princess. Thank you for everyone who watched and commented last week - it's always amazing to get feedback from people. If you'd like to know more about it you can read more in this post and the one I did on my writer's blog. Please let us know what you think of this week's installment. Last episode will be out next Monday. We've been discussing webseries for some time and there are many questions to be answered. Are there actually many more comedy webseries than drama ones, or does it just seem that way? With high-end dramas such as Compulsions, After Judgement and The Bannen Way, is there room for small, independent and/or amateur productions? Is drama simply harder to do 'right'? Is the market for drama webseries necessarily smaller than that for comedies? New Poll - take it today! With that in mind I've launched a new poll seeing what kind of webseries people generally watch. I'm trying the Blogger Poll which only allows one question so we'll see how it goes. And yes, I realise that there are many more ways to classify webseries than drama/comedy, and that some are both, but for simpilicity I'm forcing you to choose between only these two. Please take a moment to vote and we'll see how it goes. So then, what's it all about? You don't really expect me to tell you the plot, so I won't. But you might well be wondering what the heck it's all about. I mean - where are the funnies?!? Apart from hubby's brilliant voices, of course, which are still making me smile even after hearing them many, many times. It's true, when hubby originally had the idea for this latest webseries (not even two weeks ago) it was going to be hilarious. And then something happened. The story was turned around and now it's...something else. Holy cow - what's that supposed to mean? It's an Internet Play in three acts which explores love, loss and silly voices. You need to see all three acts to understand the whole thing. In total they add up to less than 10 minutes. Act 2 will be out next Monday (10th May 2010) and Act 3 on Monday after that (17th May 2010). This is something different. Of course you might not like it and that's fine. I'm very eager to hear to hear what you think, good, bad or indifferent. Thank you for all the RTs and comments! Your support means A LOT :) And thanks to @egspoony who even Tumblr'd it (I'm trying to get the hang of Tumblr but it's not easy...or too easy...or something!). 'The Webventures of Justin and Alden' occupy that sweet spot between knowing humour and self-deprecating shenanigans. And well it might, since it has been touched all over by the hands of some webcomedy masters. Written by Tony Janning and Sandeep Parikh (who collaborate so well on Legend of Neil) and directed by Sean Becker (you remember that guy? ), it stars Justin Tyler and Alden Ford. As Tubefilter's Marc Hustvedt wrote last week, it also has a support cast to die for including Felicia Day and her ninjas. Nuff said - give it a try! Another breath-taking episode from Season 3 is now up on YouTube. It has some brilliant action and lines in it, and you can read my review up on PinkRaygun.com. Tomorrow I'll be posting Episode 1 of 'Goodnight Princess', a new mini-series. This is an internet play in three acts and marks new territory for me....More about it tomorrow!